Notification with the passing of Delta Golden Wings member retired DL pilot Captain Bob Overton, age 89. 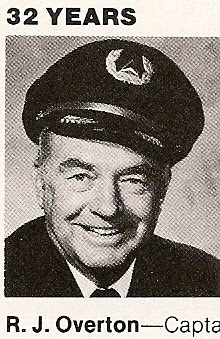 Captain Overton joined Delta Air Lines 9-02-1952 and retired at the mandatory age 60 in 1984, based Atlanta. Captain Overton’s obituary indicates that services were held today in Greenville GA.
Robert (Bob) Overton passed away September 25, 2014, shortly before his 90th birthday. Bob was born in Fort Worth, TX to the late Modrell Reese Overton and Loneta Charlene Russey. Bob served in the Air Corp in World War II in the Pacific. He was a cattle buyer in Fort Worth, until he joined Delta Airlines as a pilot in 1952. Bob retired from Delta in 1984 as a L-1011 Captain. In addition to his parents, he was preceded in death by a son, Steve Overton. He survived by his wife of 41 years, Lauren "Dusty" Lane Overton; daughter, Cherry Overton Haymes (David); son, Robert Randall Overton (Pilar); brother, Jerry Reese Overton; grandchildren, Brandon Reese Overton and Haley Haymes; great granddaughter, Kinsey Lauren Overton; many nieces and nephews. Memorial Services will be 2:00 P.M. Monday, September 29, 2014 at Greenville Presbyterian Church with Pastor Amy Arnold officiating. In lieu of flowers, donations may be made to Greenville Presbyterian Church, Gentiva Hospice Care or MEDS for Africa.